Irving, Texas — Researchers at Villanova University recently completed a study of the performance of corrugated, high-density polyethylene (HDPE) pipe containing recycled HDPE resin in commuter rail installations, finding its performance to be indistinguishable from pipe made from virgin material. The three-year field and laboratory evaluation is an important step in validating the use of corrugated HDPE pipe manufactured with recycled materials for commuter railroad and highway applications. The study was funded cooperatively by the Southeastern Pennsylvania Transit Authority (SEPTA) and the National Cooperative Highway Research Program (NCHRP) Project 4-39. 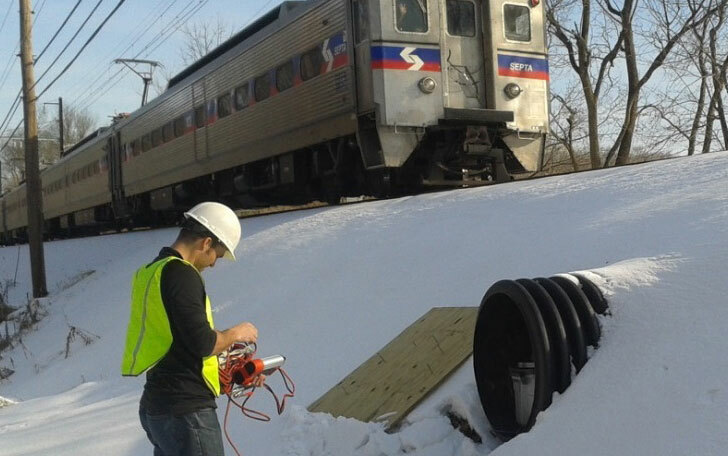 In the study that commenced in October 2013, two 30-inch-diameter corrugated HDPE pipes (manufactured by Advanced Drainage Systems, Inc. (ADS)) — one made with 100 percent virgin materials and one with 49 percent post-consumer recycled content — were installed underneath a SEPTA main commuter rail line near Doylestown, Pa., some 25 miles north of Philadelphia. Approximately 36 trains passed over the pipes daily for three years, after which a detailed analysis showed both pipes to be performing as designed with no noticeable differences between the two pipes. Measured strains and deflections on both pipes were found to be minimal and well below industry recommendations. Based on the field measurements, a laboratory test was developed to assess the long-term performance of the pipes relative to fatigue and stress cracking via the slow crack growth (SCG) mechanism. Based on this testing, it was determined that both pipes – the one manufactured with virgin materials as well as the one with recycled materials – should have a service life in excess of 100 years. “The transportation industry, just like many other areas, is seeking to incorporate more sustainable and cost-effective engineering materials and practices into their infrastructure systems,” stated Tony Radoszewski, CAE, president of the Plastics Pipe Institute, Inc. (PPI). “This has prompted research into new products that can be manufactured with more sustainable materials, such as those incorporating recycled content. The incorporation of recycled materials into products used in transportation infrastructure offers both economic and environmental benefits.” PPI is the major North American trade association representing all segments of the plastic pipe industry. “For more than 50 years, HDPE pipe has been known to stand up to tough environments including toxic waste and high pH levels,” said Daniel Currence, P. E. director of engineering for the Corrugated Plastic Pipe Division of PPI. “Its projected 100-year service life has been documented by independent studies and state and federal government agencies, including Departments of Transportation (DOT). Evaluation of the Long-Term Performance of Corrugated HDPE Pipes Manufactured with Recycled Materials for Commuter Railroad Applications by Michael Pluimer, PhD, is available free on the Plastics Pipe Institute’s website at www.plasticpipe.org.